Entropic is a group show of new collage and assemblage curated by Peter Dellert. 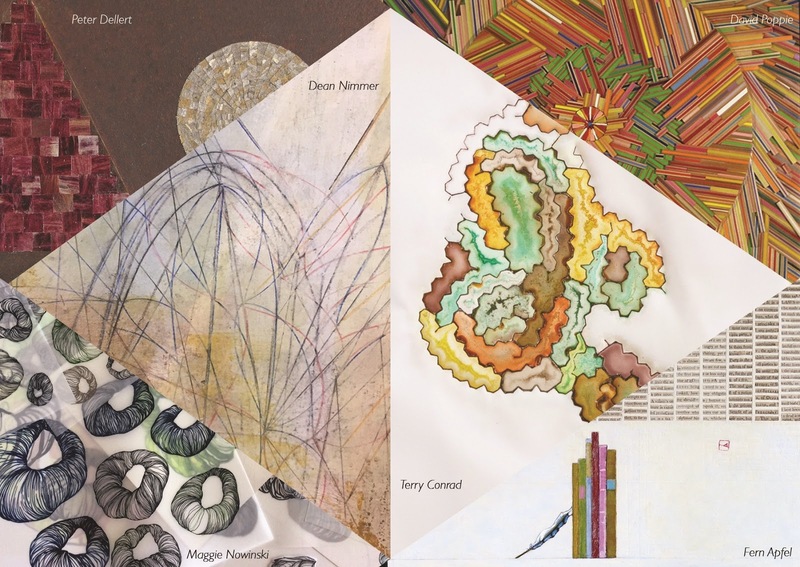 Six local and national artists using collage, painting, and sculpture explore the themes of order and disorder. They use materials from recycled text, old vinyl records, onion skin and wasp nest, colored papers, drawings on mylar, and painting to interpret the meaning of entropy, “the breakdown or disorganization of any system.” This is in response to when current political and ecological systems and sometimes personal connections become increasingly dysfunctional. The artists represented work mostly in abstraction from drawn and painted imagery to collaged and altered material, with some using recycled material that includes text and incorporating it into their work. Some of the work repeats images, material or markings which gives order to the piece, but then each artist manipulates and or layers the work further producing work that is more alarming, intriguing and disordered. These are the same challenges Dellert gives himself when approaching his work, which will also be included in the show. Dellert works with natural materials such as leaves, onion skin, wasp nest as well as vintage maps, sheet music and sometimes found and weathered manmade material such as rusted metal. It is the juxtaposition of these varied materials that Dellert believes create the energy in his work. “ I like artists who take materials and work with them, change them, alter them, and make them into something new and different”, he says. One of the artists, David Poppie, has used such simple things as match book covers, colored pencils and vinyl records to make his art. But in manipulating them, in using hundreds of one thing in a piece, the objects become his palette, and in seeing the completed piece one begins to forget what the medium was. “This is exciting,” says Dellert. “This is work beyond painting.” And this will be exciting work for Valley and Easthampton viewers to behold. Four of the artists are Valley regulars, one has been showing in New York City for years, and two are from outside the area, upstate NY and Iowa respectively and will be new to Valley viewers. “I think this adds yet another dynamic to the show,” says Dellert. www.peterdellert.com or Pasqualina Azzarello at Easthampton City Arts, pasqualina@easthampton.org www.easthamptoncityarts.org. This exhibit is funded in part by a grant from the Easthampton Cultural Council, a local agency which is supported by the Mass Cultural Council, a state agency.